Mehr Infos zu Gourmet-Spirulina hier. Better source of bioassimilable iron, spirulina helps fight against fatigue. In France, the SU.VI.MAX study showed that 91% of nonmensopausal adult women have potentially insufficient iron intakes and 24% are simply deficient. A spoon associated with a source of vitamin C allows you to ensure your iron needs of the day as part of a varied and balanced diet. Phycocyanin (one of the compounds of spirulina) strengthens the immune system. It is phycocyanin that spirulina owes its nickname of blue alga - particularly potent antioxidant pigment, it is the best indicator of the drying quality of spirulina. 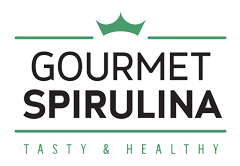 With 21 to 25% of the net weight of each sachet, Gourmet Spiruline offers the best phycocyanin levels on the market, twice as much as most spirulina on the market and as many as a thousand ampoules of pure phycocyanin sold in pharmacies ! Our Spirulina Nibs are produced in a humanitarian farm in Burkina Faso. This small tropical country has the ideal sunny climate that spirulina thrives on but severe malnutrition is very common there. In a fair trade approach, our sales in the UK help the farm achieve economic viability in its mission of supplying spirulina to vulnerable people (malnourished children, people with HIV/AIDS, etc.). Spirulina will contribute a critical intake of nutrients, either for free or at a subsidized cost. On average, for each pouch of spirulina nibs that you will purchase, our partner will be able to distribute a month of daily use for a malnourished person in Burkina Faso. Our fair trade approach is certified by Made In Respect and audited by Ecocert. A culture with a human dimension and in the organic spirit. We are poles apart from laboratories packing generic spirulina they do not know, produced by producers they do not know. We are specialists in spirulina from the world of production and we work hand in hand with our producers, investing with them and often even directly involved in production. All our productions are artisanal and equitable at least and we use exclusively techniques of ecological and artisanal culture without pesticides or phytosanitary chemicals. The products bearing the Vegan Society label are vegan products and not tested on animals. This registered trademark is the international standard for vegan products in English-speaking countries. Here our certification of our company Arthrospira SARL. The Vegetarian Society exists to influence, inspire and support people to embrace and maintain a vegetarian lifestyle. We work constructively with businesses, government agencies, policy makers and professionals, whilst always remaining independent. We rely on membership subscriptions and donations to carry out this vital work. Established in 1847, we are the oldest vegetarian organisation in the world. Our headquarters, housing the Vegetarian Society Cookery School as well as our small staff team, are in Altrincham, Greater Manchester. Here finds our all our certified products. The logo "ear of wheat barred in a circle", a guarantee for celiacs. The logo "ear of wheat barred in a circle" is well known to all celiacs. It means that the product on which it is affixed is gluten-free. This logo is the property of the Celiac Association of the United Kingdom. In 1995, she ceded the rights to the other European Celiac Associations members of AOECS (Association of European Coeliac Societies), for each one to protect it in her respective country. In one teaspoon a day you supplement your intake of iron and vitamin A enough to ensure your needs of the day. These are the two most common deficits in France, but the benefits of spirulina do not stop there: in your teaspoon spirulina crunchies (3 grams of spirulina), you will also find your vitamin B12 intake and vitamin K2 of the day and a real cocktail of antioxidants. According to your needs, and your feelings, you can obviously without any problem consume several times this quantity - this is the case of some great sportsmen, very deficient people ... or fans of spirulina! Spirulina is primarily a (super) food, so it is not consumed in perfectly defined doses. To give you an indication, with a pouch of 90g, you have enough to eat an average portion a day for a month. We only sell bags from the latest harvest, which usually gives you almost 2 years of optimal storage on each bag. They are also specially designed for optimal conservation and have a small zip to close them by avoiding moisture penetration. Thanks to their size, you make sure you have the same quality of Spirulina when you first open your pouch. How much to consume and what are the contraindications of Spirulina? The typical consumption is between one and two tablespoons per day or 6 to 8 tablets per day (sportsmen, very deficient people and unconditional spirulina). Due to the very high vitamin K content of spirulina - the vitamin that regulates blood clotting - people on anticoagulants must avoid spirulina or adapt their treatment with medical expertise. Similarly, because of its high richness in highly bioassimilable iron, people suffering from hemochromatosis - a genetic disorder of iron hyper-assimilation - must avoid consuming spirulina. A perfectly controlled product for your greater serenity with a total traceability of systematic batches between 50 and 100 kilos. Well in advance of the legislation, we exercise full traceability and exactly every lot is checked bacteriologically before being released for sale. Independent laboratories regularly analyze heavy metals and the quality of drinking water used on farms, as well as analyzes of the phycocyanin content - the key pigment of spirulina. All our productions take place in rural or semi-rural areas with a very clean environment and the whole of our approach is in accordance with HACCP principles. Final processing and packaging take place in a dedicated semi-white room undergoing ISO9001 certification.